The Spirit hub is forged from a single piece of CrMo material. This results in a beautifully simple, strong and reliable hub. The centre of the axle tapers slightly giving an hour-glass shape to reduce weight all while maintaining strength. The 36-hole flanges are widely spaced and shaped to maximize wheel strength. Spoke holes are beveled and slightly de-tempered (softened) to minimize spoke breakage. The 42 mm bearings are extremely durable: Evolution of Balance Award Winner Cary Gray rode his loaded KH36 more than 10,000 km before needing a replacement set. Compatible with all ISIS spline cranks. Together, the Spirit hub and Spirit cranks provide a strong, stiff, and lightweight setup for all types of riding. With Spirit disc brake cranks, this setup provides the high geometric strength of widely spaced flanges in a symmetrical wheel, with no requirement to remove a bearing to install the disc rotor. 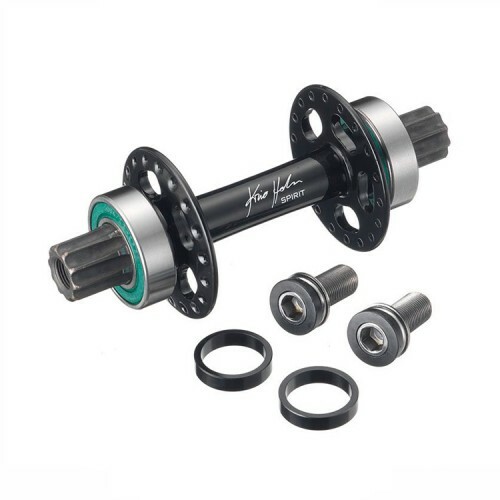 Note: This hub utilizes 42mm bearings, and is compatible with 42mm frame/bearing housings only. The Nimbus Bearing Puller has been designed to slip onto any sized Unicycle bearing and hub configur..